sjhoward.co.uk » My madcap Mencap challenge is over! My madcap Mencap challenge is over! Published on 4 March 2012. 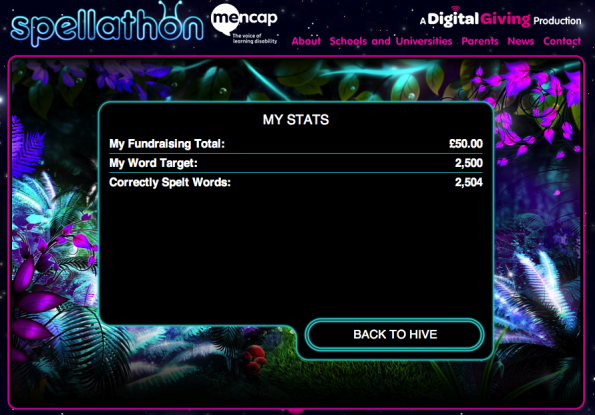 I’ve finally completed my Mencap Spellathon challenge, which was to learn to spell 2,500 words. It’s taken me quite a few weeks, but I’ve made it, and want to thank everyone who has sponsored me over the last little while. At the time of writing, I’ve raised £50, which is beyond both my own expectations and Mencap’s target. But let’s raise even more! Mencap is a great cause, supporting 1.5 million people in the UK with learning disabilities. If you gave me a penny for every ten words – that’s just £2.50 – Mencap could make that go a long way. So get over to the JustGiving page Mencap have created for me, and give them some cash. This 1,550th post was filed under: Headliner, Charity, Introspection, Spellathon.